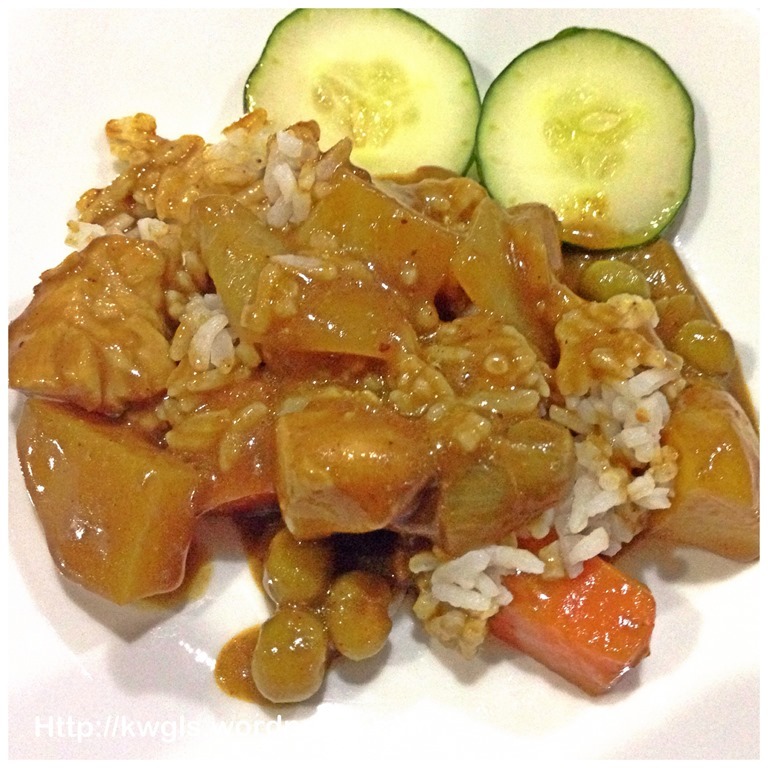 Please scroll down towards the end for an updated quicker recipe of Japanese curry cooking. 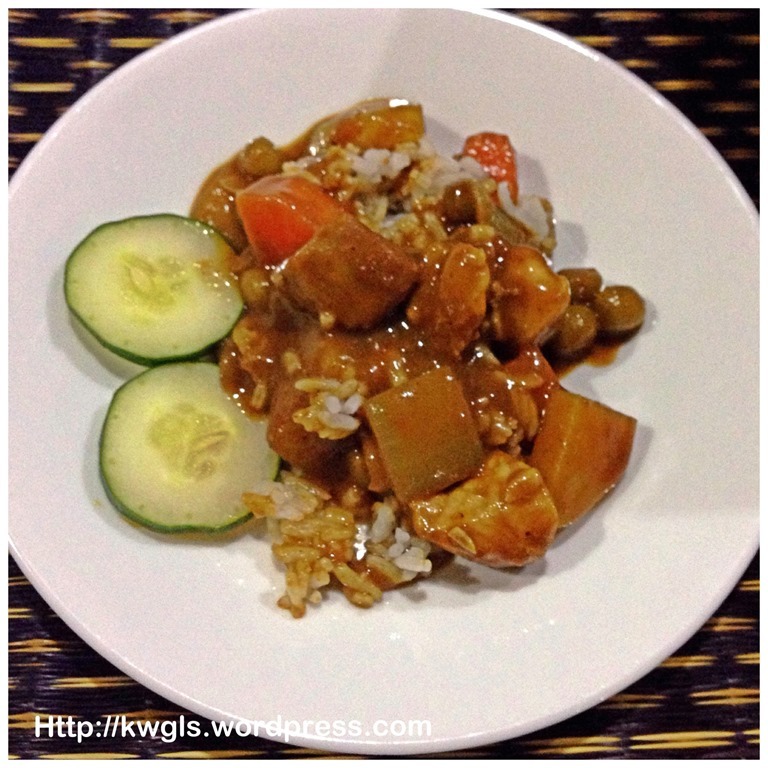 I grew up eating curries but the South East Asian type of curries. The curries that are spicy, savoury and with coconut milk. 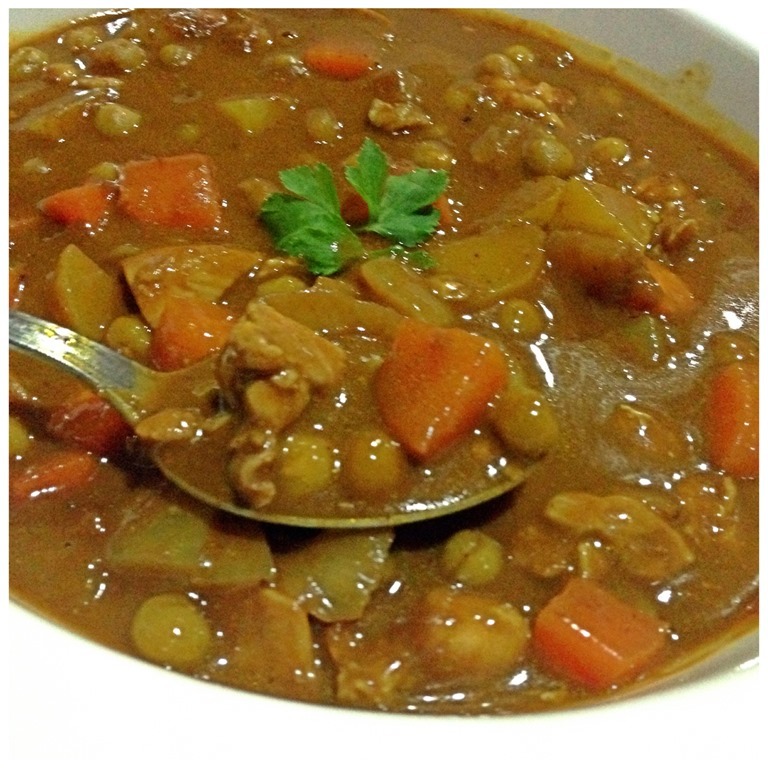 As I have explained in the Japanese curry spaghettis and Japanese curry potatoes pies post, I only learned to like Japanese curry very recently because of my kids. The curry is slightly sweet and definitely not spicy, though not my top choice of curries, but it is definitely acceptable to me. 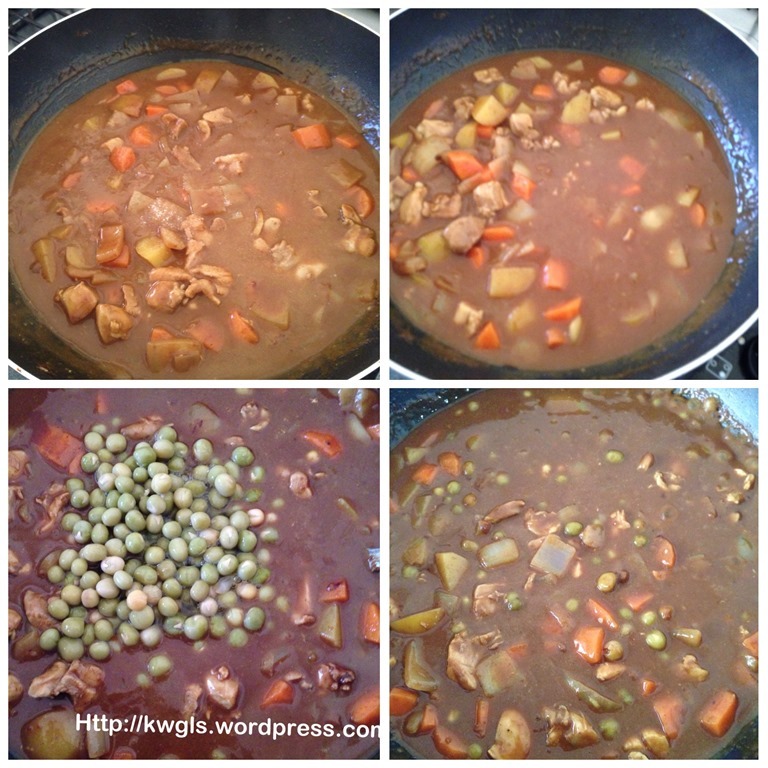 Recently, we have cooked Japanese curry rather often. All because of my kids. They love it because it is not spicy and sweet. Because of their preferences, I have to buy the Japanese curry cubes from the supermarket which is definitely not cheap as compared to the traditional Indian curry powder or Malay curry mix. 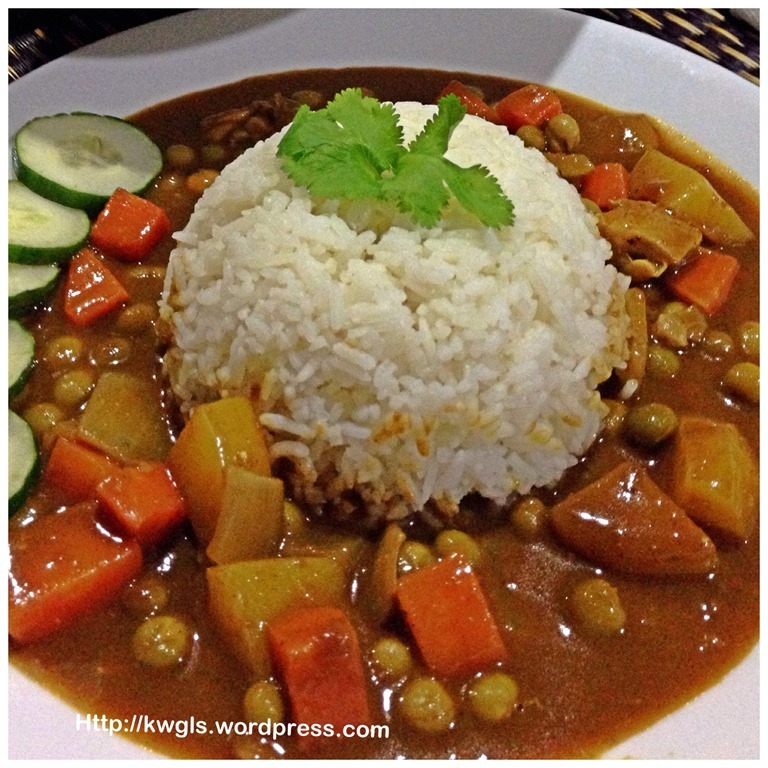 A meal will cost about SGD5 just to buy the ready mix Japanese curry cubes. 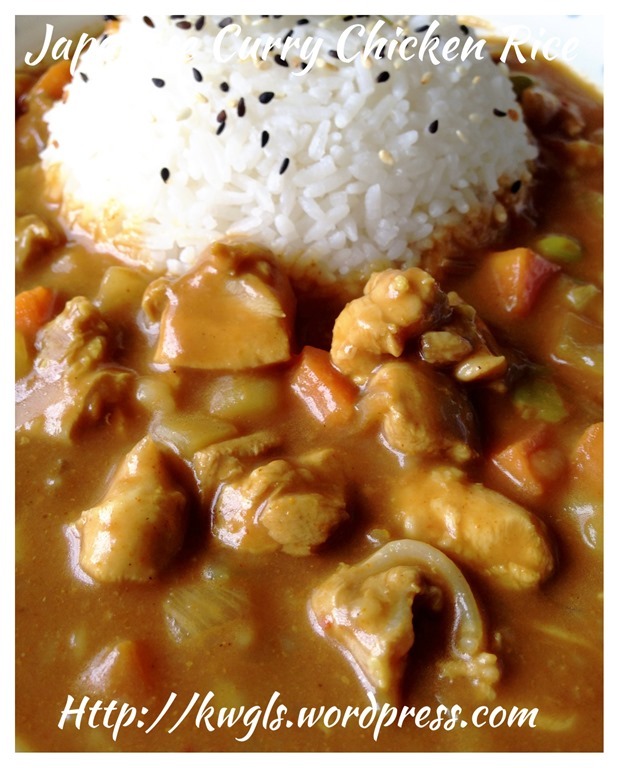 It had always in my mind since the taste of Japanese curry do not vary much with the other curries that I have tried, it means that they must be essentially made up of the same main ingredient, the turmeric or curry powder. However, there must be some other ingredients in the Japanese curry cubes that gives its unique tastes and differentiate from the Malaysian curries..
Is it not nice if I can home made these Japanese curry cubes and that will save me some money for a blogger house dad like me? 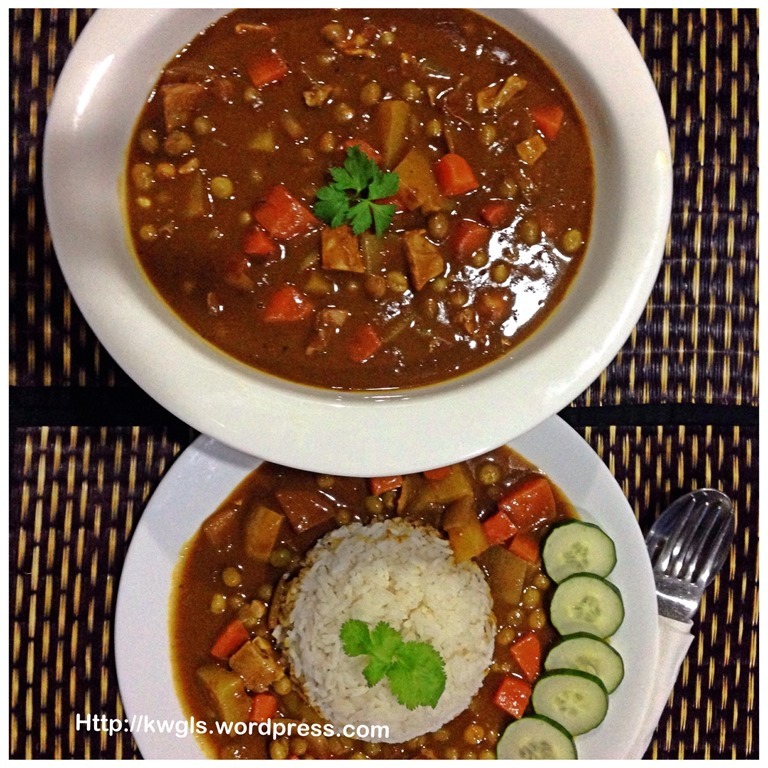 Secondly, I can share the recipe with my relatives in Malaysia who have to pay a hefty price for the small Japanese curry cubes and is not easily available.. My relatives in Malaysia have also started to like these curries because it is kids friendly. I search the net for the recipe.. 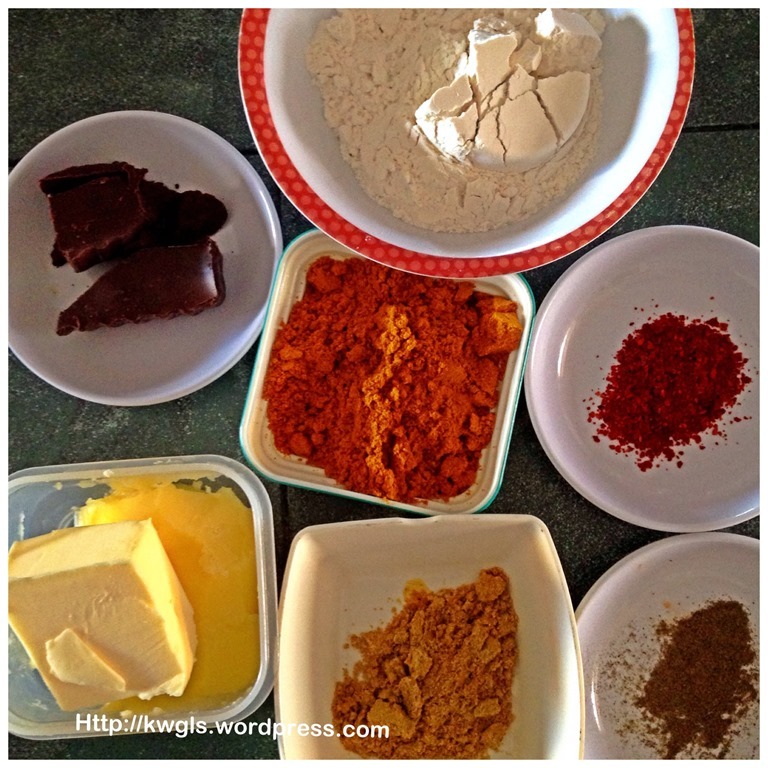 There are not many recipes available but they do have some bloggers who are willing to share. 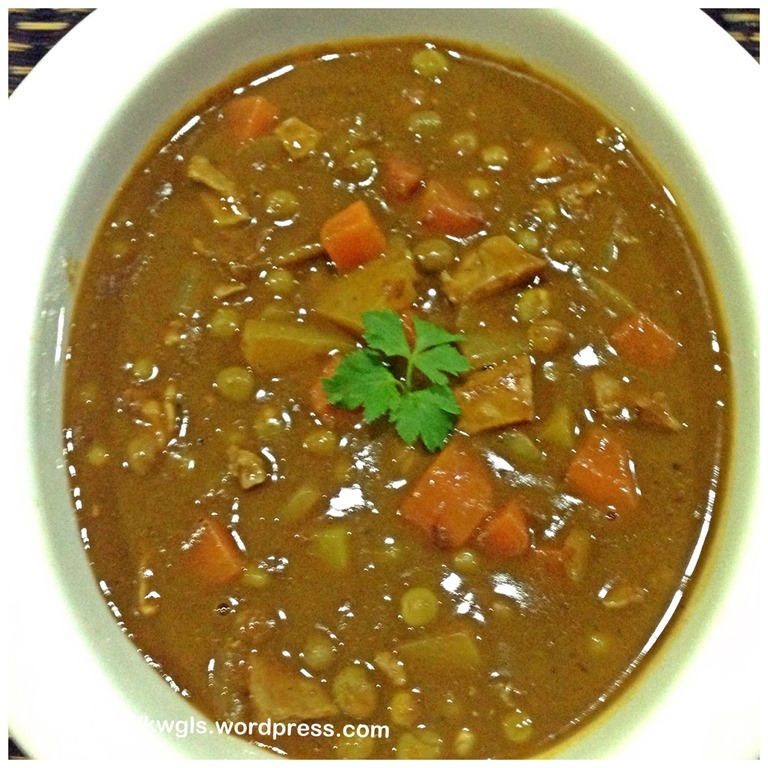 I have read 2 recipes and comes out with my own recipe of Japanese curry roux. The recipes that I have referred were from Just One Cookbook and Norecipes.com. 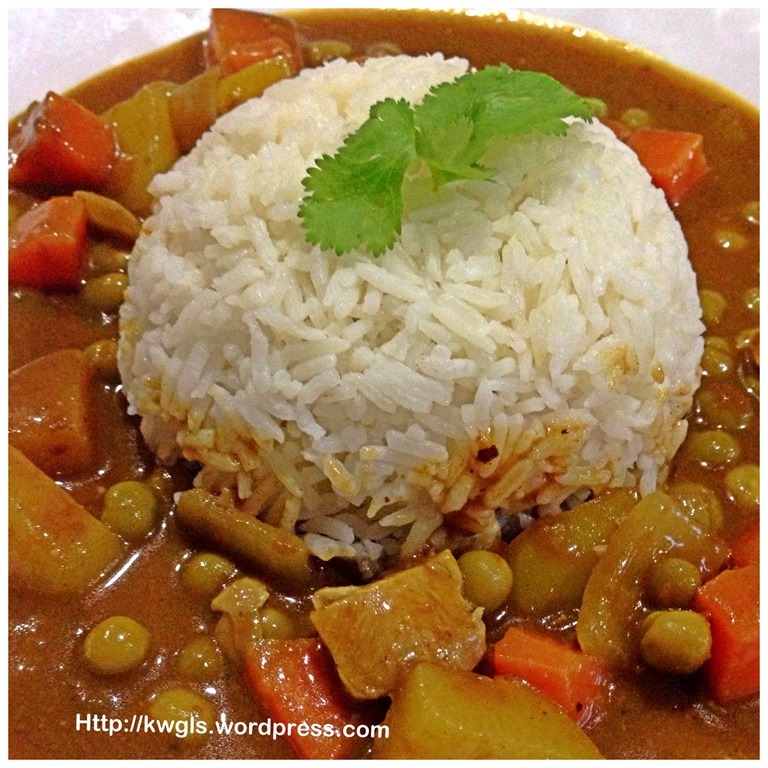 Both recipes are rather different but as a Malaysian who are familiar with curry smell, I have adjusted the recipe along the way. However, I do believe the taste come at least 85% closed to the the Japanese curry roux blocks that I have used before. One of the ingredients required is called turmeric or curry powder and both recipes called for the use of Garam Masala. I make a joke of myself when I went and bought the Garam Masala, I went to a few shops requesting for Masala Salt and it appeared that none have this item. I was rather surprised and before I gave up my hope, I went to an Indian provision shop near my housing area and told this friendly old man that I wanted Garam Masala (instead of Masala salt). To my surprise, he immediately pointed me to the shelf and asked me to get it myself. I searched high and low and I couldn’t see any salt that I was looking for. I asked him to come and showed me where it was. He just gave me a packet of curry powder with the name Garam Masala. I was even more doubtful that how come the salt became curry powder.. Subsequently, I knew where was my mistake. Garam Masala had to be used together and it is an INDIAN language meaning curry spices. I am a Malaysian and I thought it was salt because GARAM is salt in Malay language. So I have been wasting my time asking for the wrong thing! It was my mistake not to search for more before I bought the ingredients. It all depends on your family preferences. Feel free to adjust the quantity or substitute to what you like. In a big frying pan, melt the butter and/or ghee under medium heat. Once melted, add in Garam Masala, curry powder, coriander powder, chilli powder, black pepper, salt and stir fry until aromatic. Add in chocolate and let it melt in the heat. Once melted, add in the plain flour and continue stir frying. Continue to stir fry for about 15 minutes under low to medium heat until the fragrance start to spread again. It is okay if you have some lumps. Add in some water if it is too dry or difficult to fry. 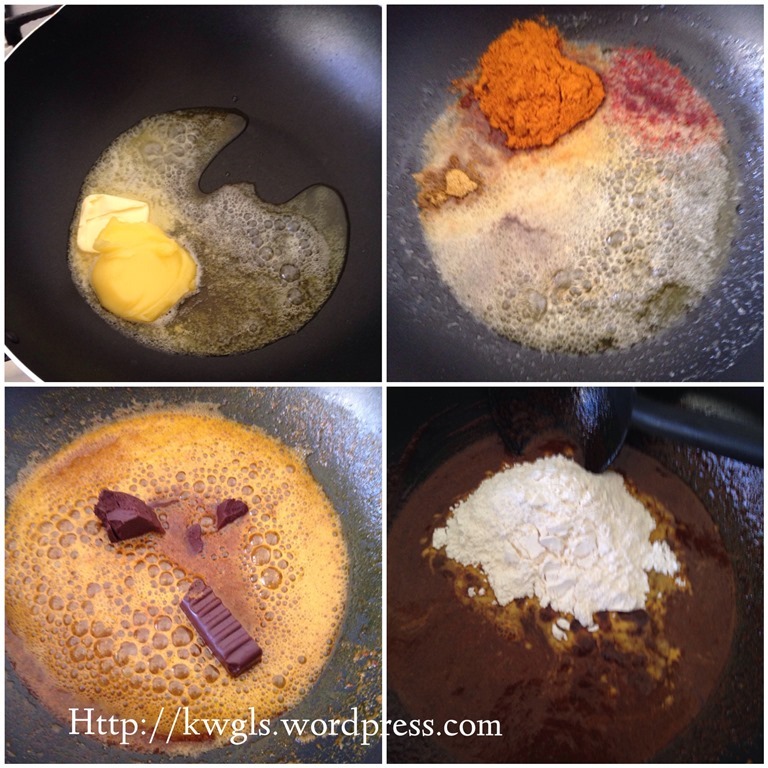 If there are some lumps, put all the roux into a food processor, blend until your desired texture. However, the blending is optional depending on your preferences. Let it cool at the room temperature. If preferred, put the roux in a airtight container and store in the fridge. It can keep for at least a month. You can also consider to pack it for individual serving. Just take a portion out for your next session of cooking. In a frying pan, add 2 tablespoons of cooking oil, stir fry the onion until the onion is slightly brownish and aromatic. 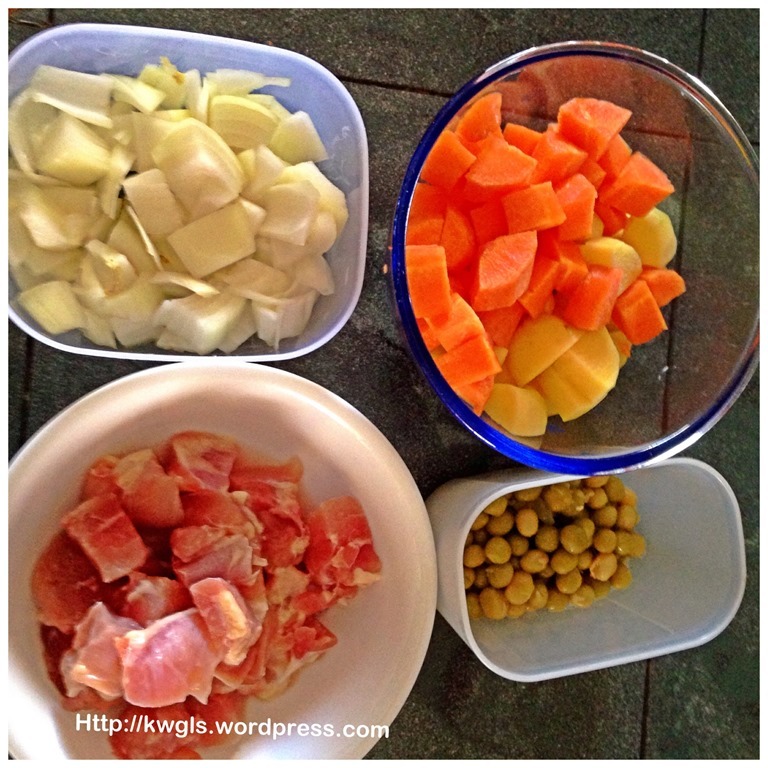 Add in chicken cubes, carrot and potatoes. Stir fry until for 2-3 minutes. Add in 2 cups of water (or water adequate to cover the ingredients, bring to boil and simmer for about 5 minutes. Add in 2-3 tablespoons full of Japanese curry roux to the frying pan. Stir well until all the roux have dissolved. Add in chocolate (optional) green peas, salt and sugar to taste. Let it boil for another 2-3 minutes. Off the heat and let it rest for 5 minutes before serving. (Note: I usually add chocolate for colour, taste and sweetening, but this is optional and depends on individuals. The amount should not be too much until it overshadows the curry flavour). Please do not ask me if it is authentic or not? I do no think it is that authentic since I have added some spices of my preference . However, the taste is very close. As far as I am able to satisfy my taste bud with a minimum fraction of costs, I am willing to try to replicate. 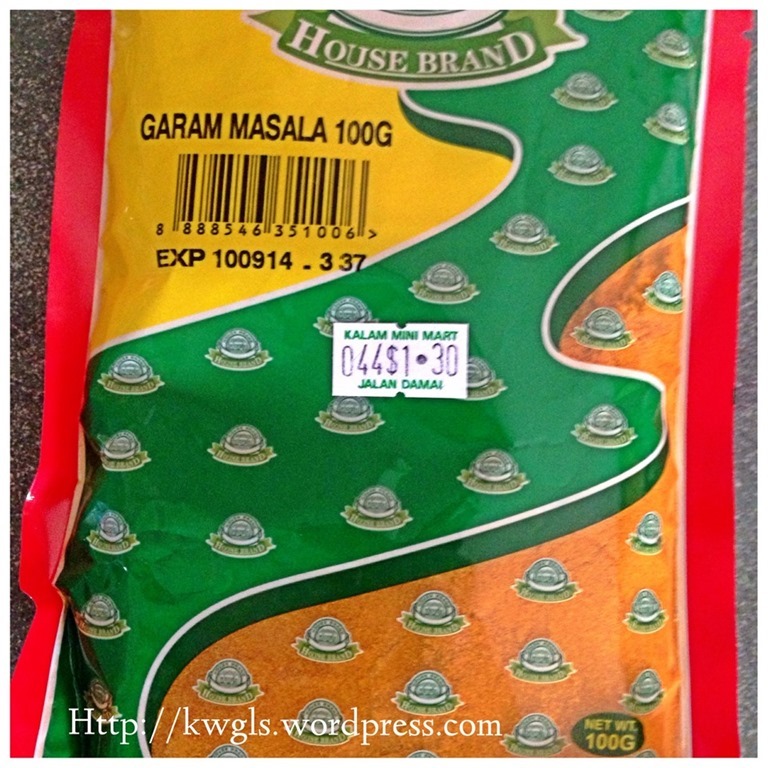 As you can see in the Garam Masala picture, 1 big packet only cost SGD 1.30 and 12 small cubes will cost about SGD 5.00 in Singapore supermarkets. For me, it is really worth the try and most important of all, it is kids friendly and a very good way to introduce this spice packed cuisine to children. You will have some leftover for you keep in the fridge, you can try to prepare Japanese curry spaghettis or making Japanese curry potatoes pies. Hope you like the post day. Cheers and have a nice day. 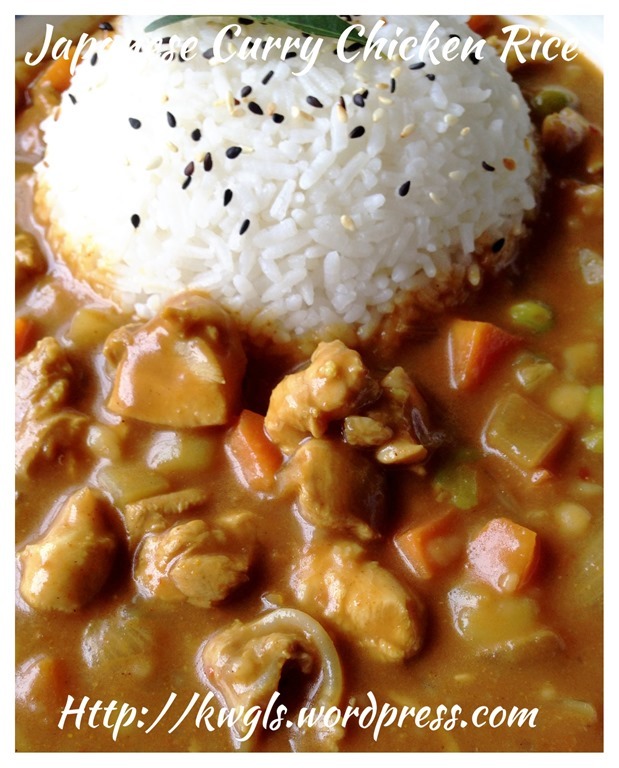 Today, I have decided to prepare these Japanese curry chicken rice for lunch. Since I do not want to take the trouble to prepare a lot of curry roux, I just cooked one portion for that particular meal only. There is no changes in the ingredients except that the ingredients were reduced accordingly. In a pot with some cooking oil, add all the powdered spices. Sauté until fragrant and add in the chop onion. Sauté again until aromatic. 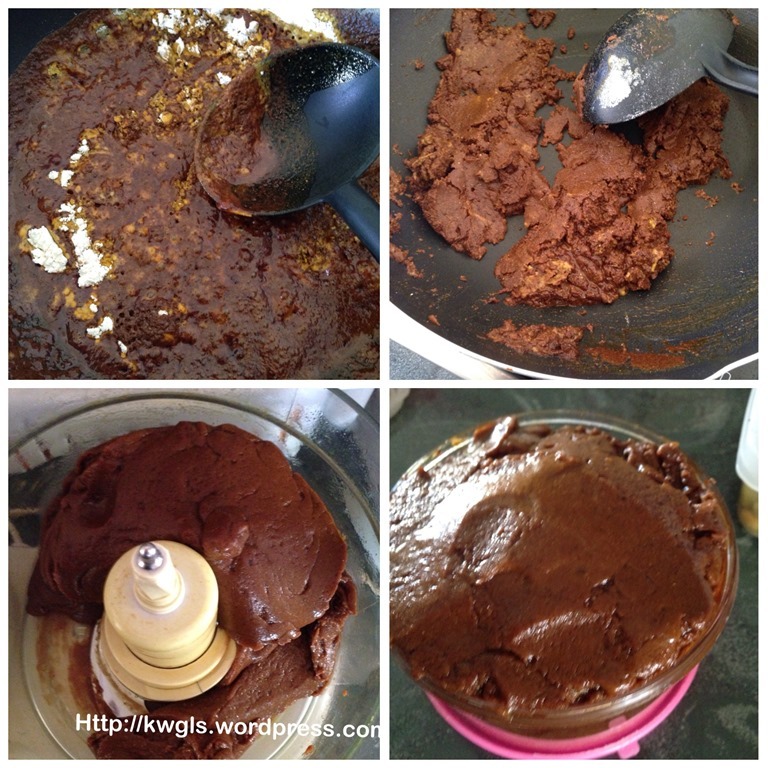 Add some water and follow by all the ingredients except plain flour and chocolate. Bring to boil and let it simmer until the meat is soft. Mix the plain flour with some water until it form a paste, add to the curry mixture and let it simmer for one two minutes. Add in the chocolate and dish up when the chocolate melts. Throughout this process, add in more water until you reached the consistency that you preferred. It took me only about 1/2 hour to get this done. 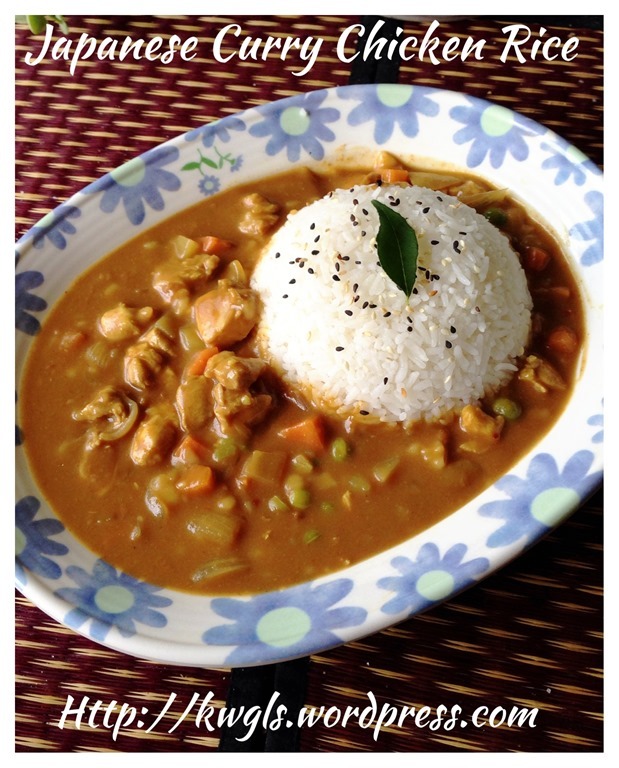 This entry was posted in Dish, Food Preparation Series and tagged 8, japanese curries, japanese curry chicken rice, japanese curry roux, japanese curry sauce, postaday. Bookmark the permalink. Hi Kenneth! Thank you so much for linking back to my post! 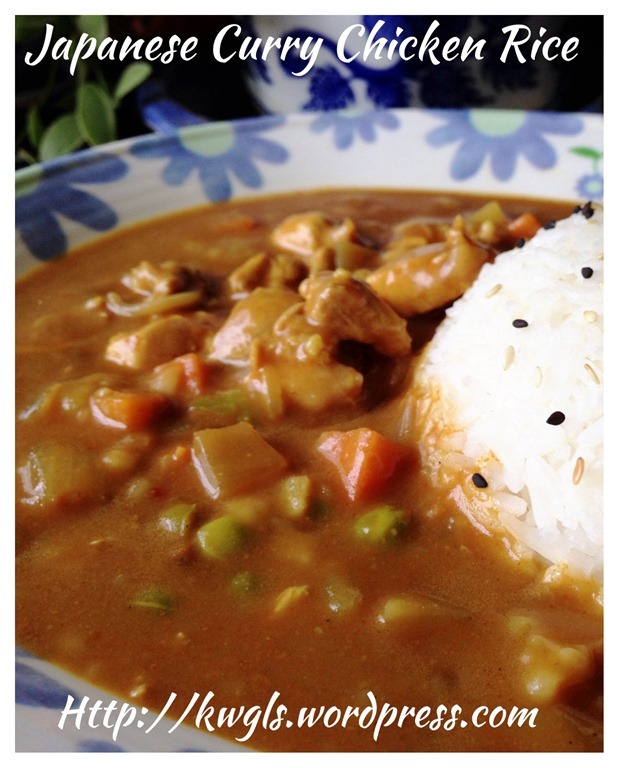 I’m happy to hear your children enjoy the Japanese curry! 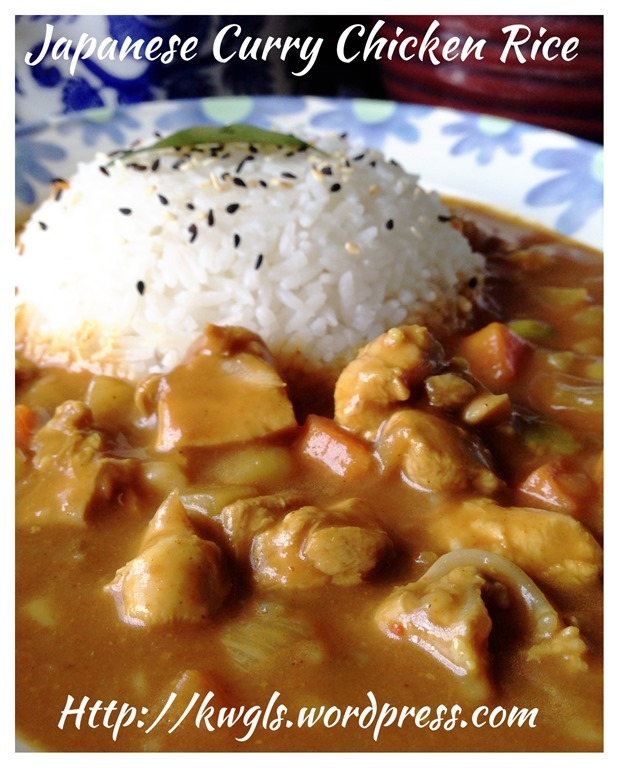 I grew up with Japanese curry, I struggle eating spicy curry now. I’m trying to introduce a little more heat for my kids so they won’t be weak like me…. 🙂 Your curry looks really delicious. Thanks again! Namiko, thanks for your recipe and I deeply appreciate it. We are the other way round. I am really happy that you drop by. Looks great. I am hungry now! this looks very yummy. I have been using S&B for awhile but I’m not satisfied, somehow it contains too much MSG. 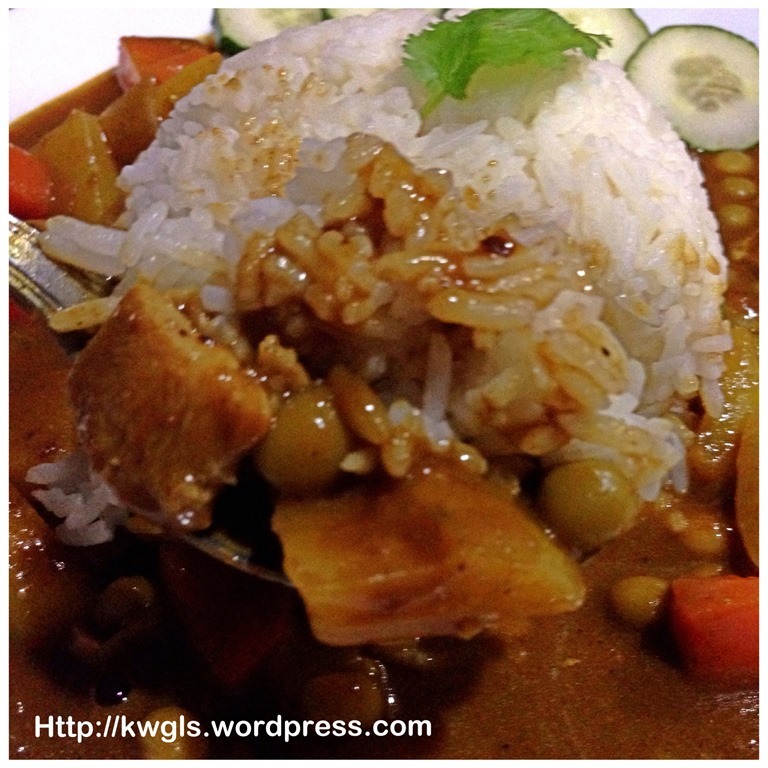 I prefer to make curry from scratch so I can know what I eat. any tips for variations? 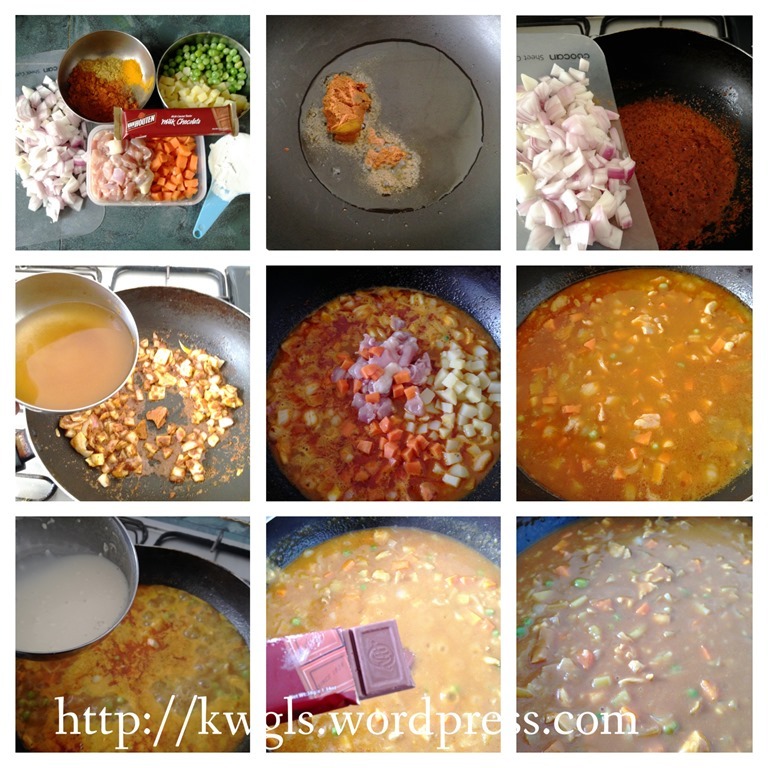 I have been looking curry recipes here and there, and it seems most recipes in internet are using instant curry roux. I also notice you put dark chocolate which is very interesting. 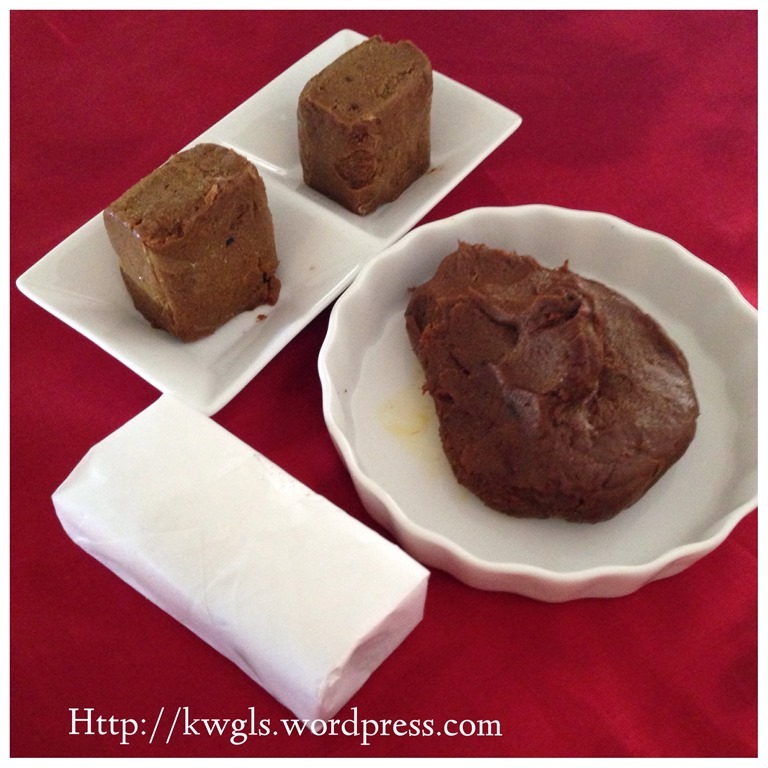 Yes。 dark chocolate make it sweeter , darker and well blend with curry roux. my first attempt to make the curry roux failed. well, half failed. basically, after the roux put into water, it simply wouldn’t “thicken”. I need to add a maize to make it thick. also, the taste was kinda bland. I saved my curry by putting a block of snb roux, at least it had a bit of taste. I think put too much cumin… well I guess it’s not as easy as it seems. Sorry to hear that, it should thicken because if too much water, higher heat will cause the water to reduce gradually. 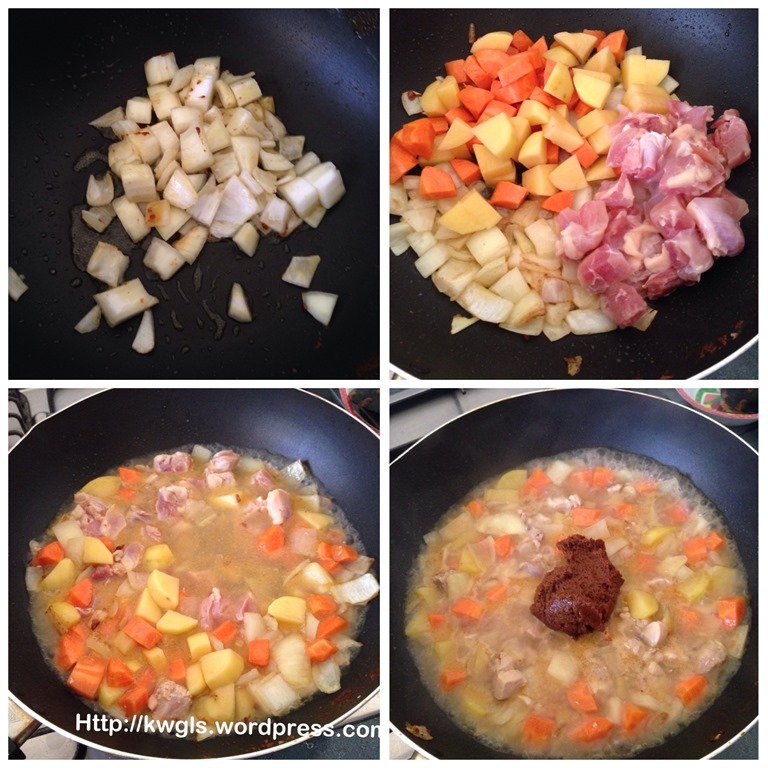 Thicken with starch will never set …Thanks for trying and hope you give it a chance again. I need to try this recipe, thank you! I love Japanese curry roux but as you said, it is quite expensive and also to Finland delivery charges on top are ridiculous. Tanks again, did the recipe and it is very close, next time I’ll put in a bit less chili and it will be very very close. I cooked some onion, carrot and potato in chicken stock in a small saucepan, then added the roux. Quite dark due to the chocolate (which doesn’t taste) but it was the flavour I was after. A very nice page. Good work. I wanted to ask you about the use of curry powder in your recipe. I see from Wikipedia that curry powder is a mixture of spices like cumin, coriander, chilli , turmeric and fenugreek. I wondered if it was possible to make up the curry powder using thee basic spices or are you referring to a different type of curry powder. Every brand of curry powder will have their own concoction of spice mix.. 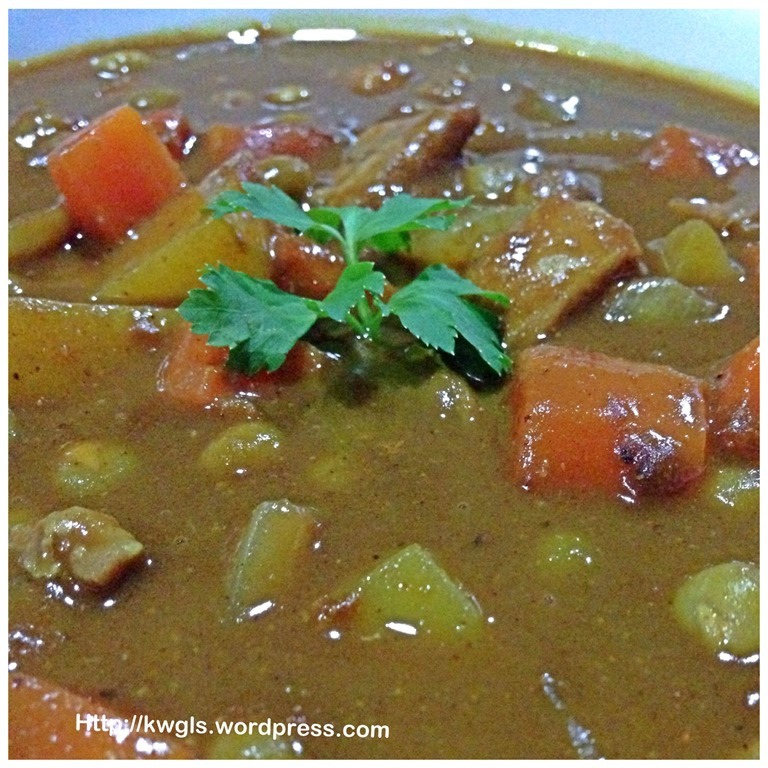 Though I grew up eating curry, we have never prepare our own curry powder again. The proportion of each spices is also critical. I believed only those who deal with spices are able to come out with something that is closed to what is sold commercially .